Jon Lybrook is owner and chief printmaker at Intaglio Editions which was established in 2006 to provide his custom technique for producing archival, photogravure-quality plates and prints to artists, photographers and printmakers alike. Since his first class in photography at age 8, Jon has pursued hand-crafted photographic art forms for most of his life. He was winning awards for his photography at the age of 14. President of the photography club in high school and an avid yearbook photographer, Jon Lybrook graduated from Bard College in 1989 having pursued an interest in experimental filmmaking and animation. Jon began painting on film with photochemicals as some of his early experiments with motion picture film. This led to a series of early luminograms by Jon Lybrook that later became a cohesive series of lightjet and inkjet prints in 2002. Jon's work was given recognition on the Behance website in 2012. After having been introduced to the concepts about high-resolution Polymer Photogravure by David Hoptman at the 2004 Alternative Photographic International Symposium (APIS) in Santa Fe, New Mexico, Jon Lybrook ardently pursued the traditional process of photogravure but using digital film output and polymer plates. 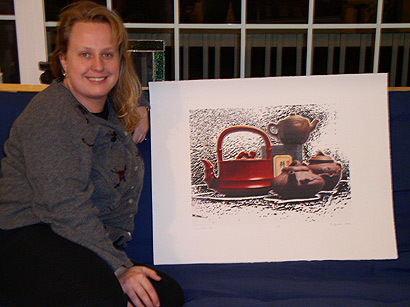 Through these initial experiments, Intaglio Editions was born. Every year, Jon and his assistants produce dozens of high-quality plates and editions of fine art prints for artists and photographers around the world. The work of Jon Lybrook has been shown in art shows in and around Colorado as early as 1996 and his work was featured in Boulder Magazine>, The Ylem Journal, and The Elements of Photography, Second Edition: Understanding and Creating Sophisticated Images by artist, author and educator Angela Faris Belt, former professor at the Art Institute of Colorado. 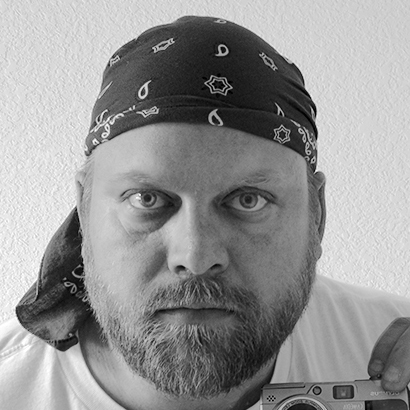 In addition to his work as an artist, printmaker, and computer professional, Jon Lybrook is owner of Chronosynthesis Productions, Inc. which operates Intaglio Editions as well as Tera Bear Consulting, and WordSecure Messaging, both software technology companies. When not working to break new ground in the areas of art and computers, Mr. Lybrook enjoys reading non-fiction, designing and experimenting process workflows, enjoying live music with his wife Bonnie, and practicing Vipassana meditation. Contact Jon Lybrook at (303) 818-5187 or email him at . You may also use our web form to contact us regarding your photogravure print project.